Team C Performance prides itself in providing the highest quality performance parts and accessories. Below are a few of the most popular manufacturers that are guaranteed to take your vehicle to the next level or performance! MSD has the firepower you need to step up your car or trucks performance! MSD is the leader in ignition technology, and Team C Performance offers a broad range of performance car parts for everything from your daily drive vehicle to your weekend cruiser. The MSD Flying Magnet Crank Trigger uses four magnets secured in the aluminum trigger wheel that pass by a stationary non-magnetic pickup to trigger the ignition. This "flying magnet" design produces accurate trigger signals and the non-magnetic pickup cannot be false triggered. MSD Ignition systems are a great way to boost performance and get the best bang for the buck. Wheather it's The Street Fire CDI Ignition for budget minded enthusiasts or the The MSD 6A and 6AL Ignition Control set the standards that other ignitions strive to reach. MSD 7AL2 and 7AL3 to go along with the MSD 8 Plus ignition systems are the standard in today's Drag racing scene. And for Modern Muscle of todays big three MSD provides a range of products of distributorless ignitions like the 6LS for LS1/LS6 and LS2/7 For 5.7 Hemi lovers theres the 6Hemi ignition that make you Mopar machine come to life. Then there's the New technology to go old school! When you retro-fit a Ford 4.6L or 5.4L (SOHC/DOHC) with a carbureted intake manifold, you'll need this new Controller to handle the ignition chores.The Controller plugs into the coil packs and sensors of the engine for a direct installation. From a PC, using our Pro-Data+ software, you can program a custom timing curve, a step retard, two step rev limiter and even a vacuum advance. A great system for street rods and retro muscle cars.Either way you go MSD and American Speed and custom will have you covered. Our DynaForce Starters/Alternators are hand assembled in the USA and never rebuilt or refurbished units. Nothing increases power on your street Mustang like a supercharger! Ford Racing Kits have thousands of hours on the engine dyno in climate-controlled temperature and altitude testing, as well as on-road validation and durability. Ford Racing Superchargers are street-legal and emissions certified: The most proven, engineered, and reliable units... period. Keep your Ford machine cool with factory engineered cooling system parts, Factory designed to keep your temperature gauge in the cool range. Remember the cooler the engine the more power you can make! FRPP crate engine begins with many new components, including rods and pistons, cylinder heads and the finest gaskets and seals available. Only after everything has been assembled to Ford's strict standards does an FRPP crate engine earn the right to wear the Ford oval. To help illustrate the FRPP commitment to excellence, we walked through the crate engine assembly line to showcase some of the many steps that FRPP engines go through to ensure that customers receive one of the highest quality crate engines on the market. Ford Air cleaner assembly, Air cleaner fastener or Air Filter will keep your car or truck engines clean. which means more money in your pocket. These filters/Cleaner assemblies are factory engineered to drop right in your vehicle. Let's face it, nothing grabs our attention at a car show or cruise night more than the hard hitting sound a thumping, high performance idle. Thumpr™ Camshafts deliver that aggressive, head-turning sound like no other cam on the market. Available in hydraulic flat tappet and hydraulic roller camshafts, Thumpr™ Cams are now available for most popular applications, carb and late model efi. 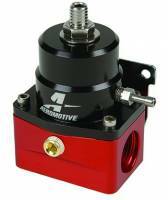 The same standards and processes that go into developing Aeromotive pumps are used for all of their products, including their regulators. Precision engineering and integrated proprietary high quality materials provide superior durability and the kind of control an inferior design can’t match. Each regulator incorporates a convoluted diaphragm utilizing proprietary elastomer materials. AeroMotive’s material and poppet design is unique to each individual regulator. These designs maximize piston stoke and optimize flow without stressing the diaphragm. Area of the poppet, pressure range and flow requirements are critical when deciding on the proper spring rate and orifice size to satisfy the specification we design to for all of their regulators. This translates to precise fuel pressure control for your specific application. 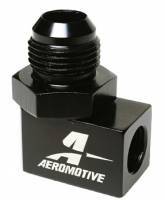 The first time you hold an Aeromotive fitting in your hand you will realize that all fittings aren’t the same. The exacting standards, tolerances and engineering that go into our state-of-the-art fuel pumps are used on all of their products including our fittings. True billet, CNC-machined aluminum, more area and smoother transition from inlet to outlet creates less restriction and more flow with less of a chance for turbulence. Designed to AN and MS specifications, their fittings not only look and perform better, they will also survive the harshest environments. Variety, quality, unmatched performance and finish leave all other filters in the dust. Don’t trust your investment with any other filter. AeroMotive’s fuel filters aren’t just better on the inside, they are arguably the most appealing filter in the industry on the outside. Machined out of Aircraft grade billet aluminum alloy and precision coated with your option of bright dip red or black anodize, hardcoat and even a nickel plated finish in AeroMotive’s Platinum Series.